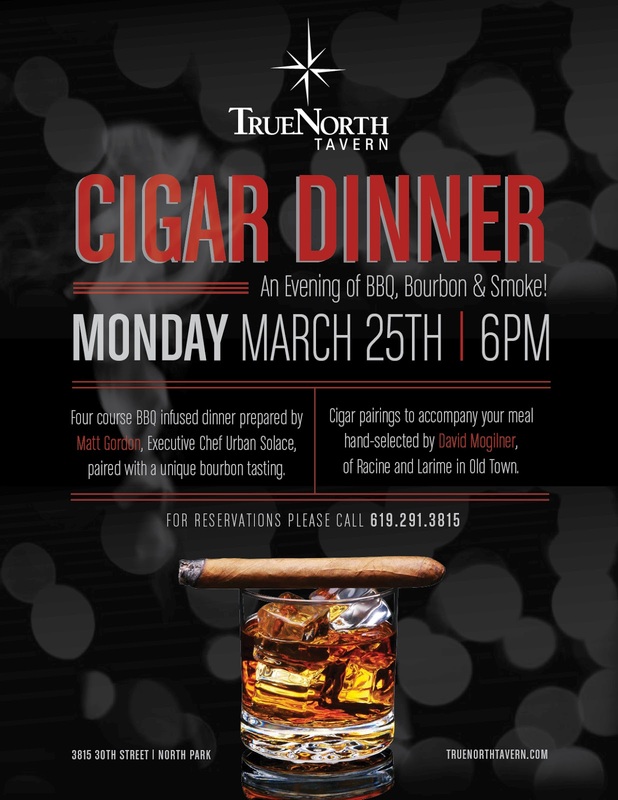 Cigar and Bourbon Dinner at True North Tavern - San Diego Dining Dish! Last Fall, I had the pleasure of visiting True North Tavern. This little bar is a true gem of food and drink in North Park, and next Monday, they will further their reputation of great drinks and food with a special cigars, bourbon, and barbeque dinner! "An Evening of BBQ, Bourbon & Smoke!” That’s right! The Dinner includes a four course BBQ infused meal prepared by Matt Gordon (Exec. chef, Urban Solace) paired with a unique bourbon tasting as each course is delivered to your table. Watch out for some additional bourbon flavor as it will be infused within the food to enhance your dining experience as well. You can also count on a bevy of spectacular cigar pairings to accompany your meal hand-selected from our friend, David Mogilner, of Racine and Larime in Old Town. So, join us for this exclusive one of a kind “Cigar Dinner” where you can come mingle with cigar aficionados and local cigar shop owners while you indulge in cigar tales from near and far. The details are in the poster below! You can make something with Berries in it (Like a tart, a pie, a buckle), Boston Cream Pie, Bananas Foster, Brownies, Bread Pudding...uhh, the list goes on, really.